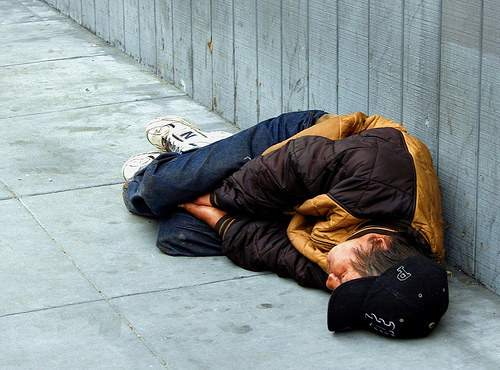 Pando: Silicon Valley's ugly rich-poor gap: What's the tech world gonna do about it? Silicon Valley's ugly rich-poor gap: What's the tech world gonna do about it? When Catherine Bracy moved to San Francisco’s Mission district from Chicago to head up the technology team for President Obama’s 2012 re-election campaign, she was struck by the difference half a minute can make. Walking the 300 feet between the well-to-do Valencia Street and the near-chaos of Mission Street was like moving between different worlds. In the four months that Bracy lived in the area, five restaurants opened on one block of Valencia, she told an audience of several hundred people at the Personal Democracy Forum in New York City in June. Just one block down, Mission Street, the thick, clotted artery of the historic district said to be built in part on Native American slave labor, and for more than a century a home to the working class and, more recently, gangsters and techies, sat in stark contrast. “I would go from a high-end furniture store to stepping over human feces and witnessing crack deals within the span of about 20 seconds,” said Bracy, who now runs the international program for Code for America. The scene she described is an uncomfortable one given San Francisco’s status as a center of innovation and wealth, a description that extends to the Bay Area in general, taking in Silicon Valley, the fabled home of the technology industry. This, after all, is a part of the country in which 43 percent of households make more than $100,000 a year, compared to 21 percent in the rest of the country. The Bay Area has the fifth highest concentration of millionaires in the US, and the median home price is $500,000. Down the 101 in Palo Alto – near where you’ll find Google, Facebook, Stanford University, and top-shelf venture capital firms – the average sale price of a home is $2 million. It is also a place, however, where the gap between the rich and the poor is growing. The median household income hit an 11-year low in 2011, according to the 2013 Silicon Valley Index, at about $85,000 a year (although that was 45 percent above state levels). The share of households bringing in less than $35,000 a year increased two percent compared to three years earlier, hitting 20 percent. The nonprofit Insight Center for Community Economic Development has estimated that a family of four needs to make $74,000 a year just to cover basic needs. And while most Silicon Valley residents saw their incomes increase in 2011, African Americans and Hispanics saw their incomes drop by 18 percent and 5 percent respectively. A separate study by Working Partnerships USA, meanwhile, has shown that Silicon Valley hasn’t added any net new jobs in 16 years; that about 31 percent of jobs in Silicon Valley pay $16 an hour or less; and that from 2000 to 2010, the portion of middle class households in Silicon Valley dropped from 62 percent to 55 percent. In the same period, the number of households making less than $10,000 more than doubled, and the cost of every major household expense category increased faster than wages. The consequences of this inequality are exhibited in plain sight throughout the Bay Area. A tent city popped up in San Jose. Google’s security guards have been protesting inadequate pay and unreliable hours. In the middle of San Francisco, Twitter employees sit on artificial grass laid out on their office building’s rooftop and eat free gourmet lunches in the sun, while the desperate and destitute self-medicate with hard liquor on the grimy street nine storeys below. The Bay Area is “one of the worst in the country” for the gap between the rich and poor, says Chris Benner, an associate professor in Human and Community Development at the University of California, Davis. But he thinks the tech industry doesn't seem to be that bothered. "I wish that they’d pay more attention to the social opportunity challenges in the region,” says Benner. If it’s true that tech people aren’t discussing the problem, then they must have been ignoring the recent press. Most prominently, George Packer drew attention to Silicon Valley’s increasing class divide in a New Yorker article in which he remarked that “San Francisco is becoming a city without a middle class.” In a story published by Salon, TomDispatch, and Mother Jones, Rebecca Solnit laid out a litany of loosely-connected criticisms in attempting to make the case that the Valley is a cauldron of “messianic delusions,” rolling Google’s troubled books project, its private buses, Sean Parker’s wedding, FWD.us’s blunders, rising housing costs, and the America’s Cup into an overblown omnibus of tut-tuttery. And of course, there’s Evgeny Morozov, author of “To Save Everything, Click Here,” with his techno-dyspepsia brought on by any mention of the word “app,” always standing at the ready to tell us how smart trash cans won’t actually put an end to poverty. All of these arguments have their flaws. Packer exhibits a blindspot to the good-doing tech companies that defy the stereotypes on which his article hinged. Solnit’s polemic cuts so wide a swathe as to render it non-sensical. And scholars will one day study how Morozov turned the production of straw men into a matter of mass manufacturing. But at the same time, none of these works should be ignored, for even if they only nibble at the truth, they also draw attention to a discussion worth having. Yes, the rich people of the Bay Area are getting richer. And yes, the poor are getting poorer. The tech industry has something to do with it – so what is it going to do about it? That is not a trifling question, and it has implications beyond tired old tropes like, “Is Google evil?” Some scholars argue that economic inequality can be terrible news for a society, and that any sector that has such an outsized societal influence as does the tech industry in the Bay Area ought to consider it a matter of urgent concern. Unequal societies lead to problems such as increased violence, low math and literacy scores among young people, weaker communities, drug abuse, low social mobility, increased physical and mental illness, and higher rates of imprisonment and teenage births, according to epidemiologist Richard Wilkinson, co-author of “The Spirit Level: Why More Equal Societies Almost Always Do Better.” While people tend to believe that these problems are only to do with poverty, Wilkinson says, it’s the gap between the rich and poor that is really to blame. Wilkson laid out the evidence for his argument in “The Spirit Level,” showing a number of scatter graphs that plot inequality against a range of social ills. For example, as many as 40 studies have shown a link between inequality and homicide rates, the book notes (see graph 1). 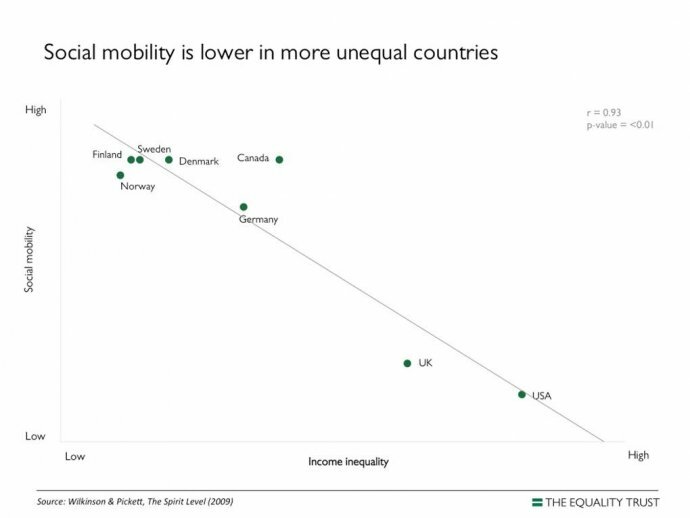 The book also shows that social mobility is lowest in highly unequal societies such as the UK and the US compared to Finland, Sweden, Norway, and Denmark, where there is high social mobility (see graph 2). Similarly, the rates of imprisonment are higher in more unequal countries (graph 3), and educational scores are much higher in more equal rich countires (graph 4). While Wilkinson suggests that closing the pay gap between top-level executives and production workers in corporations could help address the effects of inequality, in the Bay Area, a large part of the distorted distribution of wealth often comes as a result of liquidity events, such as acquisitions or public offerings, in which entrepreneurs enjoy the winnings of their hard work, big thinking, and risk taking. Some people argue that these massive cash incentives are important to driving innovation, but Wilkinson doesn’t agree. “Quite a few of the people who have made huge amounts of money were not motivated by that at all,” he says. Many are simply involved and interested in the tech itself, he says. To support his assertion, Wilkson cites research from the World Intellectual Patent Organization, discussed in “The Spirit Level,” which shows patents per head of population are marginally higher in more equal countries than they are in unequal countries. For instance, in the US and Portugal, both relatively unequal countries, patents per capita are 1.0 and 0.6 respectively. In the more-equal Japan and Sweden, however, the numbers are 7.8 and 30.1. Japan and Sweden, though, might not be great models for the US, which has its own set of specific cultural challenges, and many capitalists of Silicon Valley will likely balk at Wilkinson’s ideas about redistribution of wealth. In any case, Wilkinson’s ideological opponents think the data on inequality is less than clear. “I’ve found that not only is there not strong evidence for these claims, often there’s evidence that works against the claims,” says Scott Winship, an economic studies fellow at the Brookings Institution. When you dig into the research, there’s little to suggest that we should be concerned about rising inequality, Winship says. In an article for National Affaris in which he argued that the left overstates the cost of inequality, Winship pointed to numerous pieces of data that appear to contradict some of Wilkinson’s claims. For instance, the recent recessions suggests that low-income people don’t benefit when then wealthiest Americans earn less. “Between 2007 and 2009, when the share of total US pre-tax income received by the top 1 percent of earners fell from 18.7 percent to 13.4 percent (erasing the gains of the previous five years), median income fell by 5 percent,” Winship noted. He also pointed out that Alan Reynolds of the Cato Institute has found that poverty rates tend to fall when the share of income received by the top 1 percent increases. Winship believes that Wilkinson’s data is a classic case of mistaking correlation with causation. “You have to take seriously the possibilty that you’re looking at patterns that are driven by cultural factors,” he says. He also questions the idea that wealth redistribution is a workable solution. “Whenever we talk about redistributing incomes, we ought to be concerned about unintended consequences.” Some researchers argue that inequality is good for the economy and good for the middle class because it grows the economic pie for everyone, he points out. Some tech advocates believe in an innovation-led solution to the Bay Area’s inequality problems. While the stats might look bad from the last few years, which have been tainted by the recession when unemployment shot up across the country, the Bay Area’s tech sector is creating jobs and spreading wealth to neighborhoods in need. That mission is what was behind the founding of DBL Investors, which sprung out of an initiative led by the Bay Area Council. “There’s a lot more good news out there than perhaps the stats will show,” says Nancy Pfund, DBL’s managing partner. The unflattering data show where the Bay Area has been, she says, not where it is going. We’re only beginning to see the benefits of entrepreneurial activity in the Bay Area since the recession, she says. For instance, thousands of jobs were lost in Fremont, CA, in 2010, when New United Motor Manufacturing Inc (NUMMI), a joint venture between General Motors and Toyota, shut up shop. But Tesla Motors has sinced moved into the factory building, creating 1,000 new jobs in the area. Thanks to the “multiplier effect,” those jobs will help create other jobs, such as among factory suppliers and those in the service industry, which will help rejuvenate the region. The multiplier effect, elucidated by UC Berkeley economist Enrico Moretti in his book “The New Geography of Jobs,” describes how innovation clusters fuel economic growth in specific regions. For instance, while each manufacturing job creates 1.6 local jobs in service industries -- barbers, waiters, doctors, lawyers -- each innovaiton job creates five. While Apple directly employs 13,000 workers in Cupertino, it indirectly generates nearly 70,000 additional jobs in the area. Beyond job creation, there are other efforts under way within the tech community to address inequality. Daniel Lurie established the Tipping Point Community in 2005 to help educate, employ, house, and support Bay Area people in need. During the eight years of its existence, it has raised more than $50 million, 100 percent of which it has deployed in the service of its mission. At the end of June, it closed a funding round of $13.5 million, which will be its budget for the next year. Lurie says the disparity between the rich and poor in the Bay Area is “frightening,” but that there is an active group of tech leaders engaged in the effort to fix it. The Tipping Point’s individual contributors include Google founder Sergey Brin and his wife Anne Wojcicki, and Zynga founder Mark Pincus and his wife Alison Pincus. In 2012, Zynga employees donated $18,000 to the organization. It also has corporate partnerships with Cisco, HP, and Jawbone, among others. “I am very optimistic about the future of philanthropy in Silicon Valley,” Lurie says. Lurie also points out that there are groups helping the economically disadvantaged get jobs at tech companies. YearUp, for example, offers a one-year intensive training program for low-income young adults that provides hands-on skill development and corporate internships. Its extensive list of partners include Facebook, Google, Marketo, Twitter, and Zynga. Meanwhile, CODE2040 helps top minority engineering talent find leadership roles in tech firms. The organization has a summer fellowship that places black and Latino software engineering students in internships with top startups and provides mentorship, leadership training, and network development. On stage back at the Personal Democracy Forum, Bracy ended her speech on a high note. Despite having drawn attention to Silicon Valley’s foibles on inequality, she said she still believes it is the best place in the world for game-changing ideas. The Valley is now home to dozens of social-change startups, she said, along with a growing group of investors that support them. It is home to an emerging civic technology ecosystem anchored by Code for America, and it has also developed media platforms that will change the way we share news and information. Even the Mark Zuckerberg-backed FWD.us political lobby group is taking steps down the right path, she said. Her fear was unfounded. Hundreds of people signed up to build software for the campaign. Many of them quit their jobs, or delayed starting their own companies, so they could take part. One Facebook employee used all his vacation days so he could go to Chicago and build an election-day incident reporting tool. They were just waiting to be asked. For now, the tech world may not agree on how to address inequality. Whether it be through investing in education, enacting legislation to ensure more parity on payrolls, or by further encouraging the feverish spread of entrepreneurial activity, the industry at least seems to have made progress on the one thing it must do to close the gap between the haves and the have-nots. It is, finally, starting to talk.